On Thursday 11 October 2018, HS2 released new information and opened public consultations. Their reports and maps disclose the impact on our villages and the land likely to be required. Details relate to both the construction period, and our long term future. Copies are available online. The information released is truly devastating – while we all strongly suspected that the details previously provided fell well short of the reality, none of us could have foreseen just how bad the truth would be. While individuals working for HS2 were unable to disclose information before the official release, they clearly knew what was coming – HS2 have deceived us all. The original safeguarded area generally extended to 60m from the line, in the last release additional areas for construction were included close to the proposed lines; in the October announcement these areas have grown beyond recognition, taking in all of the greenbelt around the villages. Construction boundaries are now 10 times the original distance in most cases, and in some places extend to around 1km from the route. The reality is far worse than previous estimates. They knew much of this information prior to the previous release in June. At the point of publication, their design had already moved forward by at least six months. By the time the consultation responses are processed the design will have moved on over a year. It is hard to see how our input can influence the design when we are consulted on out of date information. They do understand that the key concerns are proximity of tunnel to village, intrusion of viaduct and impact of construction. Without significant changes, none of these concerns can be mitigated. We also know that the design has changed to such a degree that they will hold a further consultation, most likely starting in June 2019. It is important that we do continue to engage, the more written evidence and correspondence we have on record the better. Review the information for yourself. 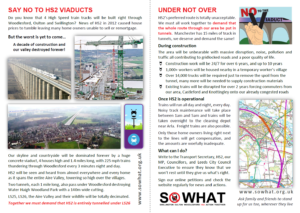 Write to our local Councillors, MP and the leader of LCC to demand that they reject HS2’s proposals. Be sure to follow our Facebook group (SO WHAT) to get the most up to date information and breaking news. We are demanding that HS2 is completely tunnelled through our area to protect the green setting and avoid all the problems associated with construction. Please sign our petition by clicking the green button. Ask you family and friends to do the same wherever they live. Since the original announcement of HS2 in January 2012 our area has been blighted, with many house prices tumbling and the property market slowing dramatically leaving many unable to move or sell. Furthermore, the exceptional hardship (need to sell) scheme and the compensation scheme proposed for those affected by the route are woefully inadequate and haven’t eased the situation at all. If and when HS2 is operational it is likely that train movements will be 24×7 – operational hours for passenger services are planned for 6am to midnight with 18 trains per hour (one every 3 minutes), but empty stock movements for cleaning and servicing are likely to extend that to perhaps 5am to 1am, there will also be overnight maintenance work on the track and equipment, and there is potential for future freight services too. More recently, November 2016, HS2 announced changes to the route in our area. While they may have removed the viaduct along the canal side, the new tunnel and increased height and length of the main line viaduct actually leave us no better off. We are still blighted and at significant risk of a massive engineering disaster given the former coal mining in the area. Our skyline and countryside will be dominated forevermore by the huge concrete viaduct – with the track at 28.5m above ground, the viaduct will tower high above the village at over 36m / 120 feet. It will be seen and heard from almost everywhere and every home as it spans the entire valley. The two tunnels will cut through Fleet Lane, diving 45m under the village before resurfacing between the canal and existing train line by the country park. Running through the floodplain, former quarry and landfill sites, abandoned mines, and the slag heap that constantly slides into the canal. What happened to efforts to move HS2 away from our villages entirely? There was a commitment to re-evaluate the station location and route into Leeds, supported by David Higgins, our MP and others who favoured an integrated station in Leeds. Despite the full support of every Councillor in Leeds who promised to do everything possible to protect the villages and our greenbelt, Leeds City Council have successfully applied pressure to secure a station location that favours their objective to regenerate the south bank area of Leeds, without any regard for and at the cost of totally devastating our area. We still believe a more direct tunnelled route, or a route largely following the existing transport corridors would be cost neutral in comparison to the complex viaduct and tunnel construction now proposed. We continue to believe, like many others, that an integrated station with through trains would be far more beneficial. We don’t accept that HS2 as currently proposed is advantageous; the costs far outweigh the benefits, which only benefit a minority of the population. We’ve already proven that there is strength in numbers. Despite LCC, HS2 did listen to us and have tried to find a better alternative within the demands being made on them for the station location. We need to stand united and respond en mass, making our feelings known beyond any doubt; why shouldn’t we be treated fairly and reasonably? Why should this project be at our direct expense? HS2, our MP and LCC need to realise that we won’t rest until we get what’s right. We need everyone in the area to write to our MP, Leeds City Council leadership and local Councillors. They all need to understand the impact that HS2 is having at all levels; crippling financial loss, a decade of disruption, a lifetime of blight and countryside lost forever. Every individual needs to speak out – the volume of personal responses is what makes the difference. Stock answers and group responses don’t carry as much weight as individual representations. Don’t be put off, we are here to help with the resources you need. SOWHAT hold regular drop in sessions at the Midland pub/café on the first Saturday of each month from 11-11:30am to provide assistance and information to local residents. We’ve started to compile video and photos showing the impact HS2 will have on our village. Have a look at our dedicated multi-media site to see the latest drone footage of our area, the scale of construction, and imagine the chaos this will cause for a decade. Check back frequently as we will be updating the material over the coming weeks. Videos are also available on YouTube. SO WHAT about the environment ? SO WHAT about fair compensation ? SO WHAT about a decade of construction and grid lock ? SO WHAT about the freedom to choose where I live ? SO WHAT about the business case ? SO WHAT about train capacity for the next 20 years ? If you would like to subscribe to our mailing list and be kept informed of our updates, please complete the form below.